Get the kitchen or batch you’ve always dreamed of – in less time than a full remodel. 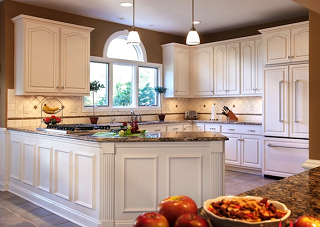 Professional cabinet refacing from Giovanni Kitchens will make your kitchen or bath look like new. And we’ll do it in days, not months. Giovanni Kitchens will help you choose the perfect cabinet style, hardware and accessories for your kitchen. Giovanni Kitchens in Utica and Sterling Heights Michigan will then replace your cabinet doors, drawer fronts and hardware, giving your tired old kitchen a fresh up-to-date look. Professional cabinet refacing from Giovanni Kitchens in Utica and Sterling Heights Michigan – now you can have the kitchen of your dreams, without changing the layout that you have become accustomed to. Call 586-322-4260 today for a FREE in-home consultation. Our customers typically save up to half the cost of new custom cabinets. This makes cabinet refacing a second-to-none money-saving option for your kitchen remodeling project. By preserving your existing cabinetry, you can save enough to truly create the kitchen of your dreams. Go ahead—upgrade to a luxury counter top, add storage accessories, decorative moldings…build in all of those bells and whistles you might otherwise forgo due to budget concerns. If you’re like many homeowners, you plan to keep the existing layout of your kitchen exactly the same but wish to renew and update its look. Cabinet refacing, also known in the industry as cabinet resurfacing, lets you keep your existing kitchen intact while completely transforming its appearance. In most cases, refacing is the superior choice to gutting your kitchen and installing all new cabinets. Not only will this save a lot of time and mess, but it will also save you about half the cost of new custom cabinetry. Since yourchoice of new cabinet doors is included, this means that eighty percent of what everyone sees in your kitchen will be brand new. It just makes sense!